Deforestation in Indonesia. Photo by Vincent Poulissen/Flickr. Where is deforestation worsening around the world? It’s a difficult question to answer, as many forest assessments are often years or even a decade out of date by the time they’re published. But we’re getting there, thanks to better data and advanced computing power. A new study by Global Forest Watch, Blue Raster, Esri and University of Maryland released today outlines a method for mapping changes in deforestation hot spots through time. Combining 14 years of annual forest loss data with Esri’s emerging hot spot analysis and big data processing techniques, we can analyze where new deforestation hotspots are emerging and see the effect that countries’ forest policies are having. Between 2000 and 2014, Brazil lost an average of 2.7 million hectares of forest per year, but the rate of loss has declined significantly since 2004. This drop in deforestation rates reflects policies enacted by the government in the early 2000s to curb deforestation in the Amazon rainforest. For example, the diminishing hot spot category is prominent within the Amazonian states of Rondônia and Mato Grosso, indicating an easing in the intensity of forest loss there. One could say that Brazil’s anti-deforestation policies were successful based on these results, but they’re also having an unintended consequence. Loss has shifted towards the unprotected Cerrado biome, made up of savanna forest and grasslands, as evidenced by the large areas of new and intensifying hot spots there. The tropical savanna with the highest plant biodiversity and thousands of endemic species, the Cerrado is currently threatened by many of the deforestation drivers that once dominated the Amazon, including soy production, cattle ranching and charcoal production. While new hot spots are less expansive in the Amazon than the Cerrado, deforestation does seem to be expanding west toward more intact portions of the Amazon. This includes a new cluster of forest loss in the state of Roraima, where new settlements are expanding from an existing road network. 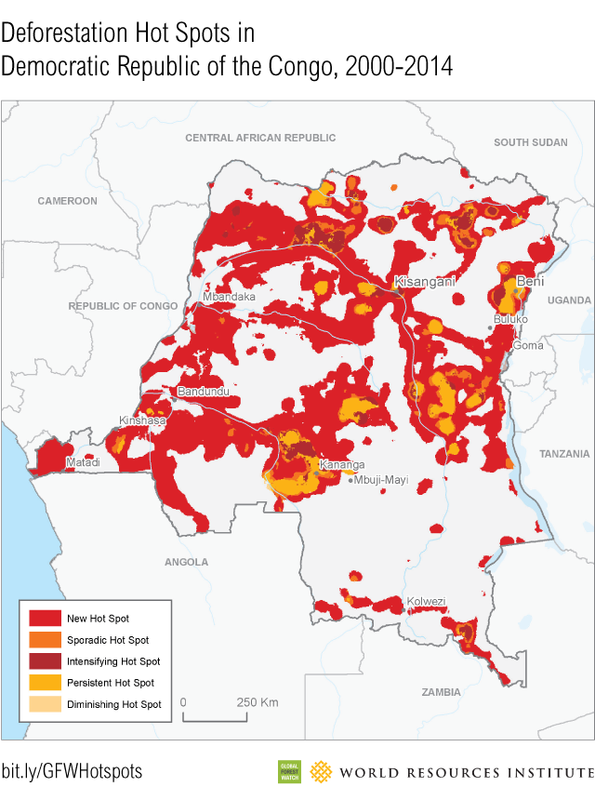 Unlike Brazil, which has been heavily influenced by anti-deforestation policies for more than a decade, emerging hot spot analysis results for the Democratic Republic of the Congo (DRC) reflect the country’s poor enforcement of its environmental regulations. From 2000 to 2014, DRC lost an average of 0.57 million hectares of forest per year, and the rate of forest loss between 2011 and 2014 increased by a factor of 2.5. Vast areas of new hotspots intersect with intact primary forests and extend into several protected areas, such as the Sankuru Nature Reserve, the world’s largest continuous protected area for great apes. New and intensifying hot spots of loss radiate out from the city of Beni in the eastern province of North Kivu, where longstanding civil unrest has led to a wave of human migration. However, recent easing of conflict and increasing economic growth are also seen in the results. New and intensifying hot spots are also found along road networks and near city centers such as Kisangani. Forests in these areas are likely being felled for agricultural land or charcoal production to accommodate a rapidly growing population.